Scientific Name: Bungarus caeruleus. Other Common Names: Indian krait. · The common krait is a steel-blue snake growing up to 3 to 4 feet in length (sometimes up to 7 feet), with whitish bands or half-rings throughout its back (Fig 12.5). Occasionally, it may be grey or dark brown in colour. The markings consist of paired white bands which may be less distinct anteriorly. · The common krait has small dark eyes, and the pupils are almost invisible. The upper lip is white or yellow, while the belly is very white. · A chain of hexagonal large scales throughout the mid-doral aspect of the body (Fig 12.6). · The subcaudals (ventral scales distal to the vent) are undivided, unlike other elapids. · The 4th infralabial scale is the largest of the infralabials. · The common krait is a reclusive snake which prefers to reside in crevices of rocks or logs of wood, and being nocturnal, emerges only during the night to hunt for prey. Its primary diet is other snakes. It can be found all over Peninsular India and often seeks habitation near human dwellings. 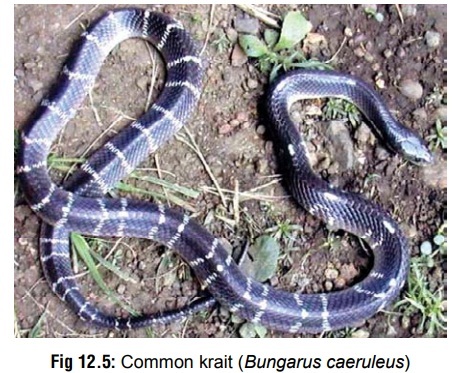 · The common krait may enter houses and hide in dark corners, cupboards, bookshelves, etc. It does not hiss, but occasionally makes a faint whistling sound. These snakes prowl on hot humid nights; they often do not strike, but make a quick snapping bite. Predominantly neurotoxic. It is the most venomous snake of India.